Fish are great as pets, provided you understand how to take care of them. Aquariums are great places to look at in your house. But the work involved in keeping an aquarium can put off so many people. If you manage to keep them healthy and hygienic, they shall reward you with their beauty and sparkle. This means you need to know which fish is easier to care for. It is important to also go for those that live well with others. Here is a guide to various tropical fish, and their proper feeding needs. Danios are small, active and colorful fish. These are commonly presented in red, yellow and green. You will see them as active but they are not aggressive and do well with other species. They shall do well in a large aquarium with gravel and plants at the bottom, with pH levels close to that of fresh water. Black Molly, however, can live in any water. They are thus easier to care for. They are normally platinum colored, dusty gold or black. They prefer to eat flake and pellet foods, bloodworms and brine shrimp. They can live with other fish as long as they are not larger. Platies are even more colorful, mostly in blue, purple, red-orange, and yellow. They can be bred to produce more color blends. They are passive, and don’t mind living with other passive fish are. Their males are usually tinnier than the females. They do well in warmer water and eat flake food, freeze-dried food, and algae. Guppies are the more playful ones and tend to breed a lot. If you keep some, it is only a matter of time before you have a full family. The female species is normally twice as big as the meals in size. The males, on the other hand, are the more colorful species. Rainbow fish have several colors on. They appear even more colorful once they settle in the aquarium. They are not aggressive or that much active. Glofish are similar to Danios, except for their neon shine. They prefer the company of other less aggressive fish. 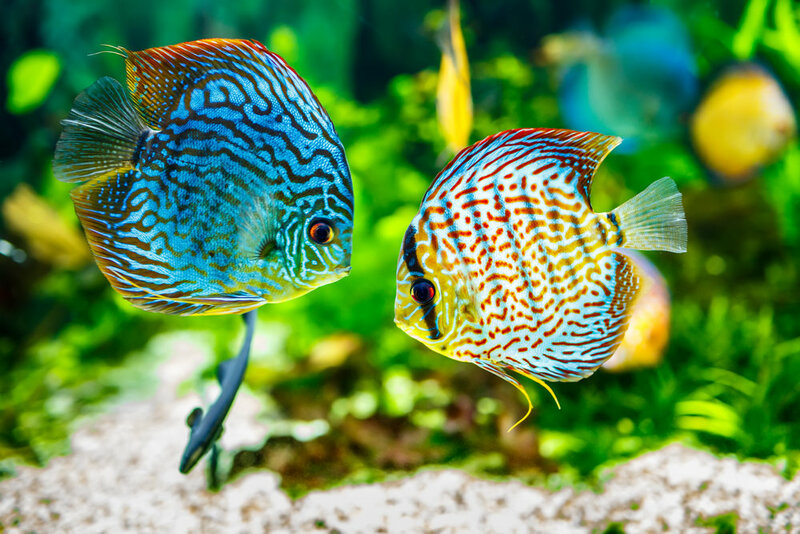 These are some of the fish that shall give you a great looking aquarium, with minimal maintenance work. Since most of them do not mind living with other species, you can mix them up to achieve variety in the aquarium’s display. You will find more fish species that you can add on, which you can read more about here. This entry was posted in Pets & Animals on January 23, 2019 by admin.